The Railroader, L.W. 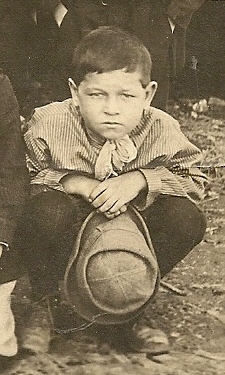 Buckland, Jr., recounted to me his relationship with the tragedy many years ago and kept a copy of the Bluefield Daily Telegraph that reported the accident. As dad told me the story, it was with heart-felt words and with a look in his eyes that he knew he had been saved from death on that dreadful day in 1946. There is no doubt in my mind, and I believe he absolutely understood, that it was by divine intervention that he was not a part of the crew onboard Engine #604 the Powhatan Arrow the day it wrecked in Powhatan, WV. As a young fireman on the Norfolk & Western Railway, Dad said that he had been working this run from the extra board while the regular Fireman, Beecher Lawson was marked off on vacation. On the day of this accident, the fireman marked back up for his regular assignment as fireman on the prestigious passenger train, relieving L.W. from the job and back to the fireman’s extra board. The Powhatan Arrow made it’s maiden voyage in April of 1946, just two months prior to this accident. Steam engine crews enjoyed the speeds they could attain on those engines and as is no surprise, the cause of the accident was listed a “excessive speed on a curve”. 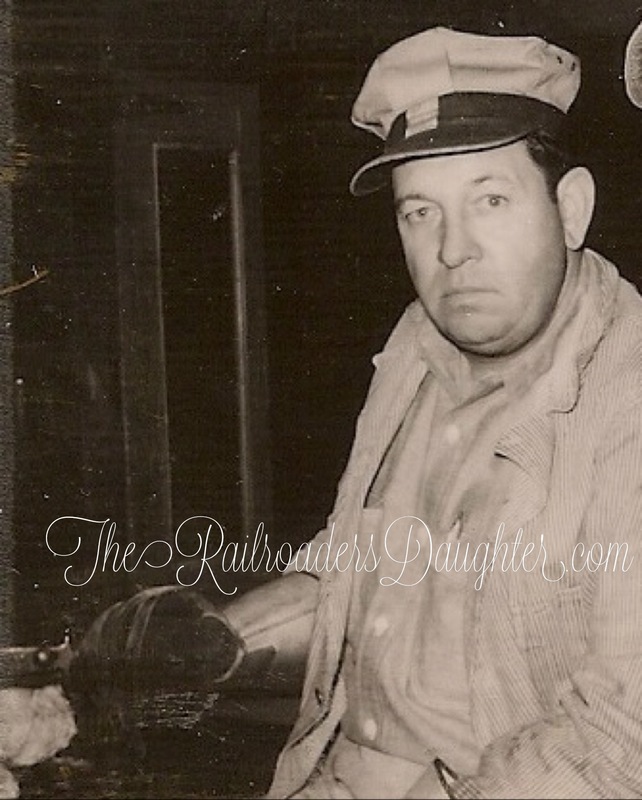 The second picture is of the railroader in later years and an enginemen on a diesel. According to: (source-Bramwell,WV) Two Bluefield railroad men were killed and two others injured in this Norfolk and Western train wreck at Powhatan, West Virginia, 18 miles west of Bluefield, WV. 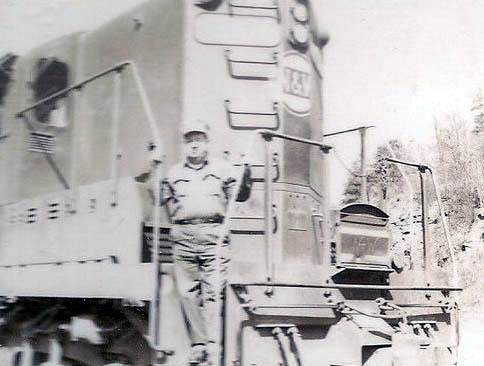 Engineer Grover C. “Nap” Roberts and fireman Beecher Lawson were killed when the eastbound crack stream-liner “Powhatan Arrow” left the tracks…Eleven passengers were hurt in the wreck. 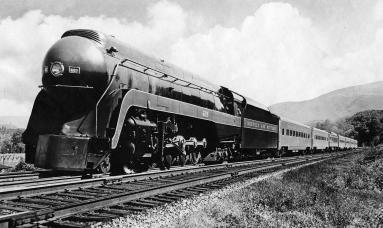 This deluxe train was eastbound from Cincinnati, OH to Norfolk, VA. Several thousand people from Mercer and McDowell counties were attracted to the wreck. It was reported that automobiles lined both sides of the highway for more than a half mile. The “Powhatan Arrow” had made it’s maiden run on 27 April, 1946. File Number 2997 Railroad NORFOLK & WESTERN RAILWAY Date 06/12/1946 Location POWHATAN, WV. Accident Type D.
Estimated speed: Approximately 55 m. p. h.
IN THE MATTER OF MAKING ACCIDENT INVESTIGATION REPORTS UNDER THE ACCIDENT REPORTS ACT OF MAY 6, 1910. 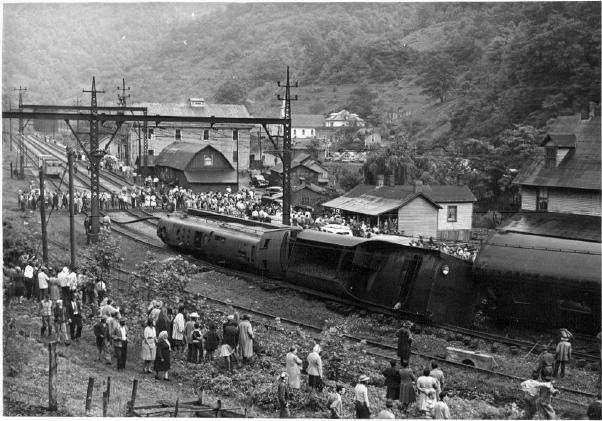 On June 12, 1946, there was a derailment of a passenger train on the Norfolk and Western Railway at Powhatan, W. Va. which resulted in the death of 2 train-service employees, and the injury of 23 passengers, 3 dining-car employees and 1 train-service employee. Diagram Inv. No. 2997 Norfolk and Western Railway Powhatan, W. Va. June 12, 1946. Location of Accident and Method of Operation: This accident occurred on that part of the Pocahontas Division extending between Williamson and Bluefield, W. Va., 99.57 miles, a double-track line, equipped with an overhead catenary system for the electric propulsion of trains. In the vicinity of the point of accident trains moving with the current of traffic are operated by timetable, train orders and an automatic block-signal system. The accident occurred on the eastward main track 79.12 miles east of Williamson; at a point 757 feet west of the station at Powhatan. From the west there are, in succession, a tangent 1,220 feet in length, an 8 degrees 53’curve to the left 1,103 feet, a tangent 430 feet, a 4 degrees 02’curve to the right 800 feet, a tangent 425 feet and a 12 degrees 54’curve to the right 220 feet to the point of accident and 535 feet eastward. The grads for east-hound trains varies between 1.175 percent and 1.036 percent ascending 4,000 feet, then it is, successively, practically level 800 feet, 1.325 percent ascending 800 feet arid 1.254 percent ascending 1,093 feet to the point of accident and 200 feet eastward. In the vicinity of the point of accident a siding lies between the main tracks. The west siding-switch is 443 feet east of the point of derailment. On the curve on which the accident occurred, the track structure consists of 131-pound rail, 39 feet in length, laid new in 1944 on an average of 22 treated ties to the rail length. It is fully tie plated with double shoulder tie-plates, double spiked, provided with 6-hole angle bars equipped with joint springs, and an average of 9 rail anchors per rail length, and is ballasted with crushed stone to a depth of 24 inches. The maximum super elevation on the curve was 5 inches, and the gage varied between 4 feet 8-1/2 inches and 4 feet 8-7/8 inches. At the point of derailment the super elevation was 5 inches and the gage was 4 feet 8-3/4 inches. The maximum authorized speed for passenger trains on the curve involved is 35 miles per hour. A speed-limit sign bearing the numerals 35/28 is located immediately south of the south rail of the eastward main track, at a point 1,067 feet west of the west end of this curve. On tangent track the maximum authorized speed for passenger trains is 40 miles per hour. No. 26, an east-bound first-class passenger train, consisted of steam engine 604, a 4-8-4 type, three coaches, one dining car, and three coaches, in the order named. All cars were of steel construction. This train passed Eckman, the last open office, 4 miles west of Powhatan, at 3:12 p.m., 9 minutes late, and while it was moving at a speed estimated to have been approximately 55 miles per hour the engine and the first two cars were derailed. It was raining at the time of the accident, which occurred about 3:18 p.m. The engineer and the fireman were killed, and the conductor was injured. The, total weight of engine 604 in working order is 494,000 pounds, distributed as follows; Engine truck, 101,600 pounds; driving wheels, 282,000 pounds; and trailer truck, 104,400 pounds. The specified diameters of the engine-truck wheels, the driving wheels and the trailer-truck wheels are, respectively, 36, 70 and. 42 inches. The rigid wheelbase of the engine is 18 feet 9 inches long, the total length of the engine wheelbase is 47 feet 3-1/2 inches, and the total length of the engine and tender is 109 feet 2-1/4 inches. The tender is rectangular in shape and is equipped with two 6-wheel trucks. Its capacity is 20,000 gallons of water and 35 tons of coal. The weight of the tender loaded is 378,600 pounds. The center of gravity of the engine is 77 inches above the, tops of the rails and the center of gravity of the tender when fully loaded is 79 inches above the tops of the rails. The engine is provided with No. 8-ET brake, equipment and a speedometer. The journals of the engine and tender and the cars of No. 26 are provided with roller bearings. The cars of No. 26 are provided with tightlock couplers. The tender was equipped at its rear end with a type E coupler. No. 26 was moving on a l2 degrees 54’curve to the right when the engine and the first two cars were derailed. The engine overturned to the left arid stopped 373 feet beyond the point of derailment. The maximum authorized speed for this train in the territory immediately west of this curve was 40 miles per hour, and on the curve it was 35 miles per hour. There was no defective condition of the engine prior to the accident. There was no indication of dragging equipment, defective track, or of any obstruction having been on the track Examination of the engine after the accident disclosed that the automatic and independent brake, valves were running position, the throttle lever was in closed position, and the reverse lever was latched on the quadrant in about 25 percent cut-off position for forward motion. There was no condition found that would prevent proper application of the train, brakes. As the, train was approaching the point where the derailment occurred, the members of the train crew were in various locations throughout the cars of the train. These employees said that the cars had been riding smoothly, and they were not aware of anything being wrong until the derailment occurred. They were unable to give an accurate estimate of the speed of the train, or to give definite information as to whether a service application of the brakes was made to control the speed immediately prior to the derailment. The engineer and the fireman were killed. The surface, alignment and gage of the track on the curve are well maintained for the maximum authorized speed of 35 miles per hour. There were no wheel narks between the rails at the point of derailment. At the point of derailment there was a flange mark which extended across the head of the high rail a distance of 6-1/2 feet. This mark probably was made by the tender when it was pulled from the track by the engine. There were numerous flange marks eastward from the point of derailment, caused by the derailment of the cars. The road foreman of engines said that it is customary to control the speed of passenger trains on the ascending grade in the territory involved by easing off on the throttle rather than by the use of the automatic brake system. It was his opinion that when No. 26 was approaching the curve involved the throttle was open to the extent that the train was moving at a speed somewhat in excess of the maximum authorized speed for the curve, that as the engine entered the curve the engineer suddenly moved the throttle to closed position and that, since the cars were provided with tightlock couplers and the journals of the equipment were provided with roller bearings, a sudden run-in of the slack occurred between the tender and the following cars, which resulted in an increase in the speed sufficient to cause the engine to overturn on the curve. The theoretical overturning speed at the point of derailment for engine 604 was 56 miles per hour. The engine was equipped with a speedometer but no speed recording device. It appears that the train was moving at overturning speed, as the engine overturned to the outside of the curve without marking the rails, and slid on its left side to the point where it stopped. However, a speed somewhat less than 56 miles per hour combined with a run-in of slack between the tender and the cars could have caused the engine to overturn. It is found that this accident was caused by excessive speed on a curve. Dated at Washington, D. C., this thirty-first day of July, 1946. By the Commission, Commissioner Patterson.